Jane Mobley, a remarkable woman. Wilson Daily Times, 1 June 1931. In the 1870 census of Stantonsburg township, Wilson County: Henry Rountree, 35, farm laborer; wife Patsey, 30; and children Jane, 15, Amos, 10, George, 8, Hannah, 6, Bettie, 4, and Margaret, 1. On 9 March 1898, John Mobley Jr., 21, son of John and Jane Mobley, married Miss Julia Penn, 20, daughter of Lou Penn, in Wilson. Columbus Gay applied for the license, and Baptist minister W.T.H. Woodward performed the ceremony in the presence of W.H. Neal, Sallie Neal, and Lesley Mobley. In the 1900 census of Wilson, Wilson County: John Mobley, 50, teamster; wife Jane, 46; and children Fannie, 12, Charlie, 13, farm laborer; Patience, 10; Henry, 9; Mary, 7; and James, 23, day laborer. In the 1910 census of Wilson, Wilson County: on Nash Road, odd jobs laborer John Mobley, 53; wife Jane, 56, nurse; and nieces in law Mary Rountree, 16, nurse, and Patsy Whitehead, 7. In the 1920 census of Wilson, Wilson County: at 120 Vance Street, farmer John Mobley, 64; wife Jane, 65; daughter Fannie Mobley, 23; and grandchildren Mary Jane, 7, and Alexander Mobley, 13. Fannie Mobley, 29, daughter of John and Jane Mobley, married John Faulkland, 28, son of Philipp and Rachel Faulkland, on 2 December 1922. Free Will Baptist minister E.S. Hargrave performed the ceremony in the presence of J.W. Rite, Joseph Faulklin, and Boston Witingham. John Mobley died 13 June 1923. Per his death certificate, he was about 60 years old; was born in Washington, North Carolina, to Javis and Harriet Mobley; was married to Jane Mobley; resided at West Lee Street; and had done masonry work. Informant was Fannie Faulkland, 200 West Lee Street. In the 1930 census of Wilson, Wilson County: at 1001 Gold Street, Lamar H. Winstead, 38, book merchant; wife Anabel, 37; son William, 13; and servant Jane Mobly, 85. ← 1007 East Nash Street. 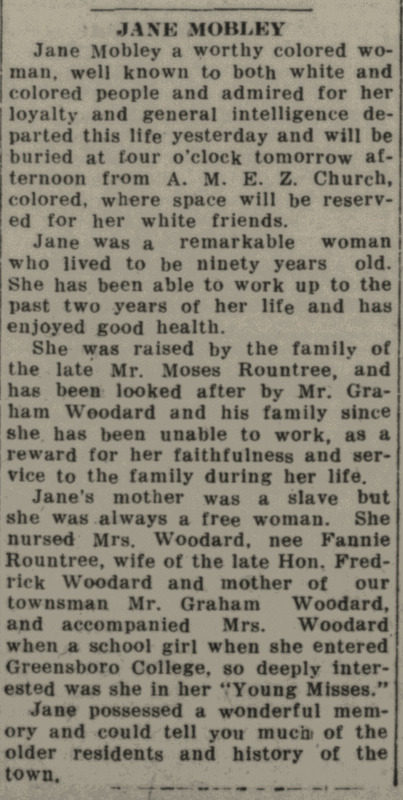 Thank you for sharing a portion of Jane Mobley who is my 3grandma.According to family oral history she was never enslaved.She was an African Queen who arrived here at the tender age of 7.her surrogate parents were Henry and Martha/ Patsey Rountree who were enslaved by the Rountree family.Everything that that paper said about her is true.There is so much more about Moses Rountree family and Jane in our oral history which is supported by other documents. Hi Lisa after looking through family documents we found listed in the will of Nathan Rountree is that he had great concern for slaves Patsey, Jane ,Amos and Ginger.Also upon Jane Mobley death she was listed in the household of William instead whose wife were name executor of her estate.we know that Darden funeral home had her body but do not know where she is buried.oral history have several version1.windstead cemetary,Rountree, and several relatives said she was buried in a white folk cemetery by the rountree family.If u have any additional info or come across anything in relation to her or her husband John Mobley family please let me know, I graciously appreciate it. Hi Lisa in the 1880 census John B and Jane Mobley children were Rhode Henrietta James Isaac John H .James married Eliza Price.later to this union were Fannie, Charles, Mary and Patience.Thank u so much for sharing our history. Thank you! If you have photos of any of these family members from the pre-World War II era, I’d love to share them in Black Wide-Awake! Hi Lisa just saw your post.we lost all old family album on hurricane Floyd.I do have a few, how can email them to you? Thanks, Carolyn. I’m so sorry to hear of the loss of your valuables in that terrible hurricane, and I’m glad you’re willing to share what you have. I can be reached at lisayhenderson at gmail dot com.